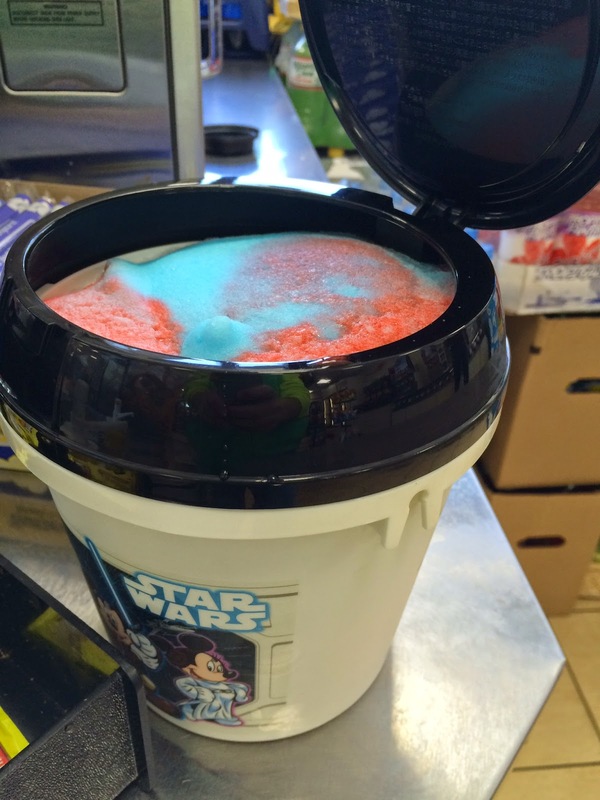 As always, I was reading Foodbeast and found an interesting promotion at Seven-Eleven, and it's called "Bring Your Own Cup Slurpee Day" with a hashtag; #BYOCupDay. It's held today, on April 11th, 2015 from 11 AM ~ 7 PM in the states, so we brought out "cups" which can be anything as long as it can fit a 10-inch (25.4 cm)-diameter-hole set at each branch, and the cost is 1.49 dollars before tax. I brought a Hello Kitty bucket it's from Edible Arrangements, and my husband brought a popcorn bucket from Tokyo Disneyland. I measured them at home beforehand so we're so ready to fill the cup. 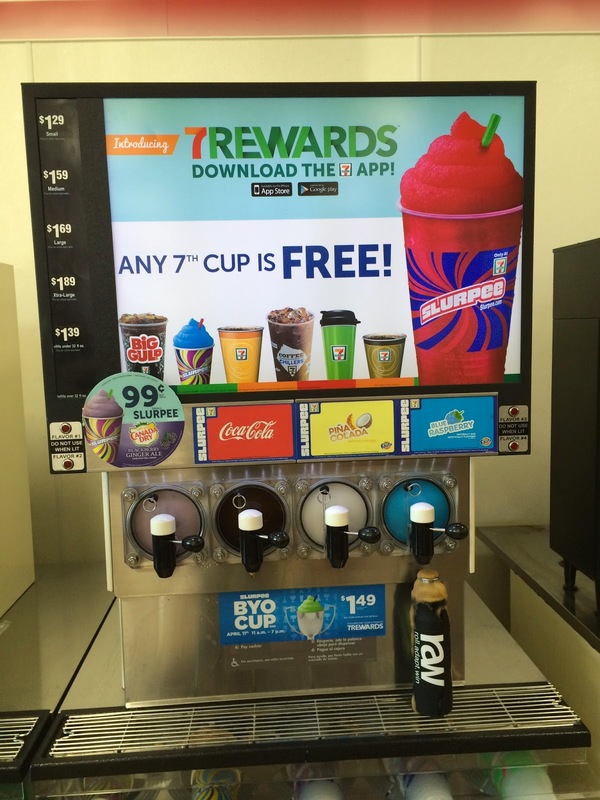 About Slurpee, it's a frozen carbonated flavored beverage available at Seven-Eleven. 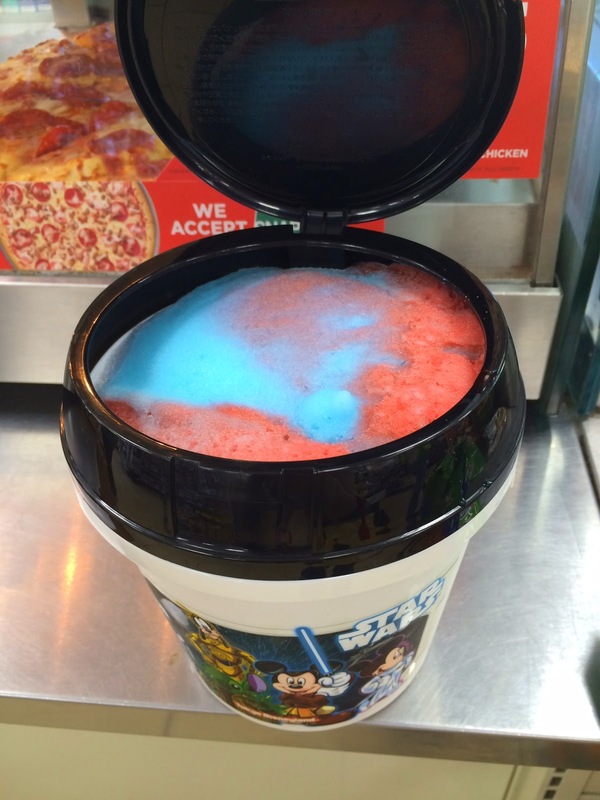 Also, this is my first time ever to try Slurpee in my life, so I was so excited about this great event. 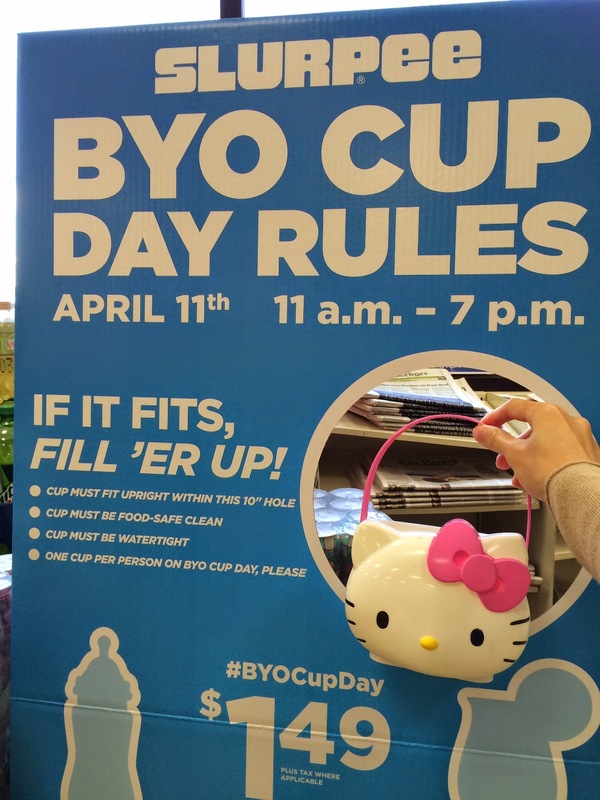 Apparently, this is the first time to be held in the U.S. while Seven-Eleven in Australia, Canada, the Philippines and Malaysia have held this BYOCup Day before, according to the press release. 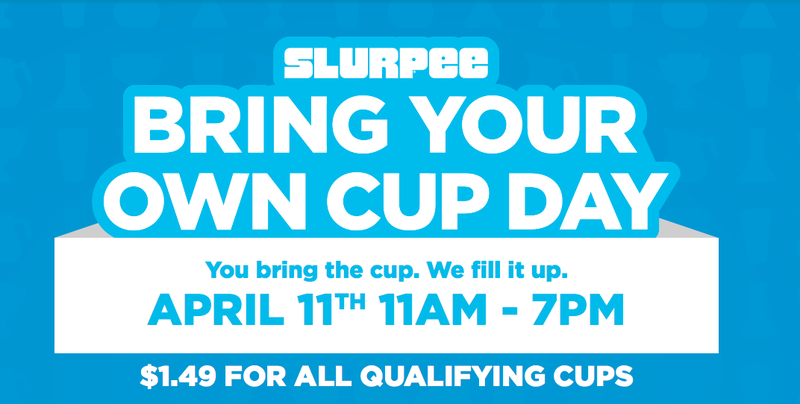 I was afraid that there'd be a huge line for this glorious event, but luckily, there's no line and it seems like we're the first people who brought the crazy cups to the Seven-Eleven with full of excitement, at least I was psyched. 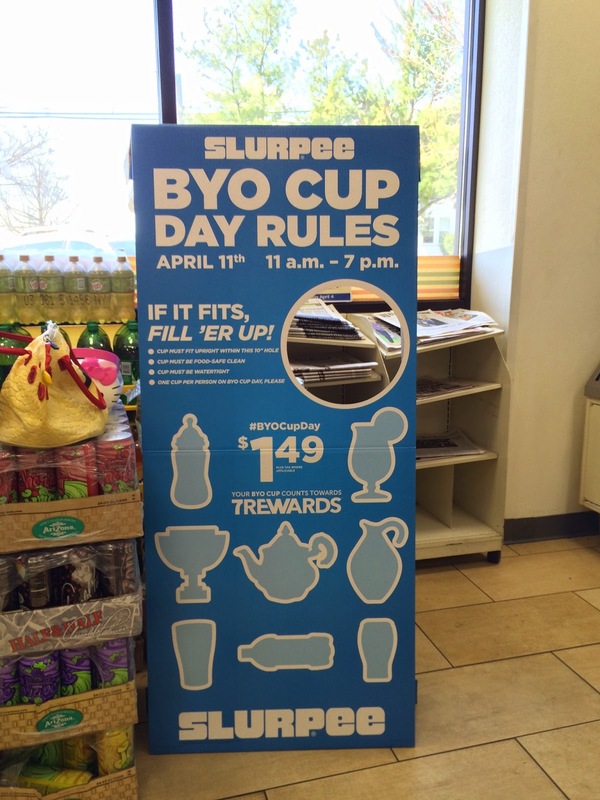 And we got there around 11:05 AM, so we could have been the first ones for BYOCup Day. 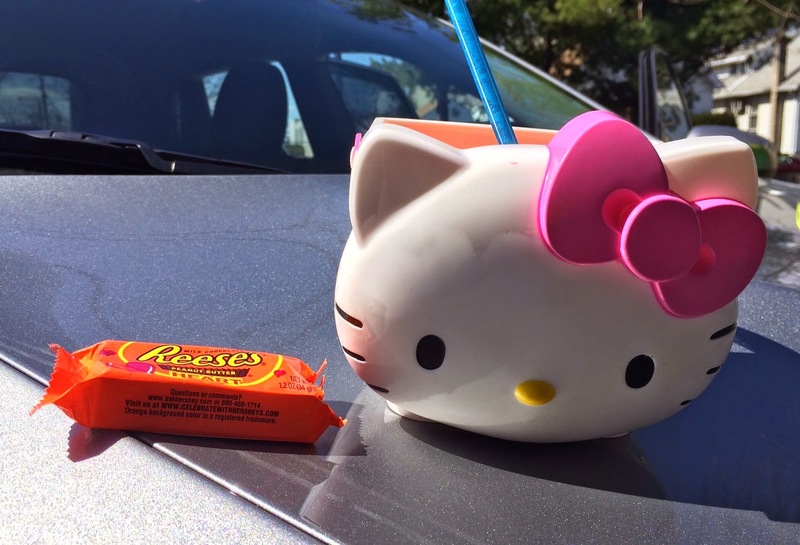 My Hello Kitty bucket fit perfectly. The flavors were Blackberry Canada Dry Ginger Ale, Coca-Cola, Piña Colada and Blue Raspberry, from the left. 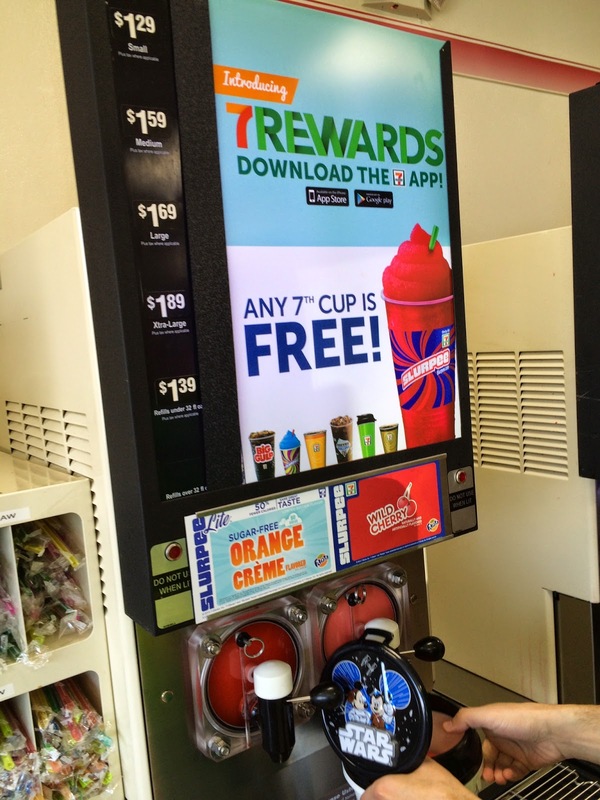 This machine had Orange Crème and Wild Cherry from left. It's allowed to mix the flavors, so I chose all the flavors expect Coca-Cola and Piña Colada. This is the "cup" my husband used. 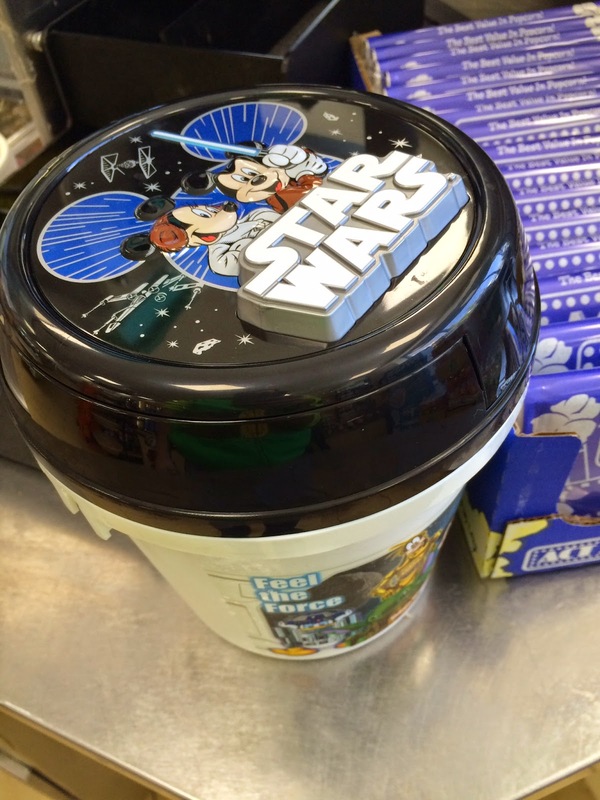 The characters are dressed in Star Wars costumes. 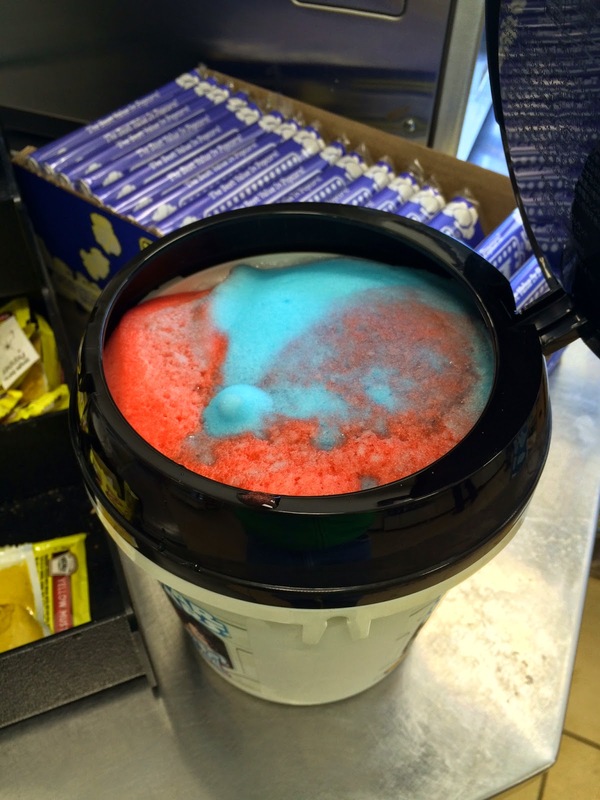 He mixed Blue Raspberry and Wild Cherry, which he always mixes, he says. 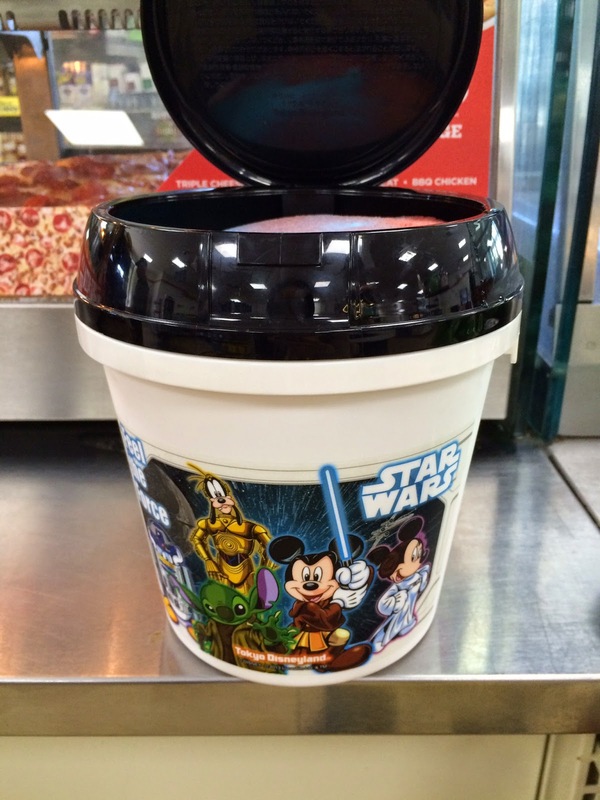 When we brought these cups to the cash register, an owner said, "It's a cute bucket, let me take pictures of you guys," so 3 of us held our own cups and he took photos. After the payment, he gave us Reese's chocolates! It's sweet! 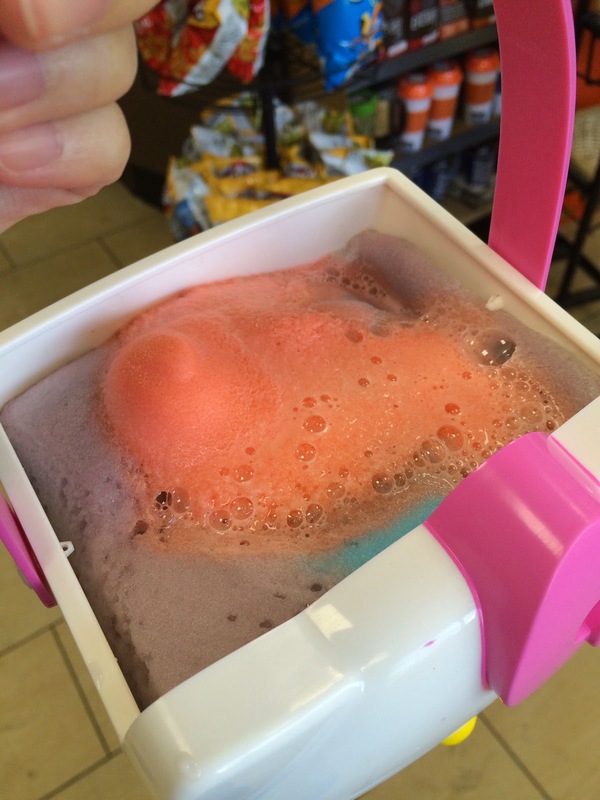 My first-ever Slurpee was very tasty. Sour and fruity flavors from all the berries and orange, and refreshing taste from ginger ale. I thought it'd be too sweet but as it's cold and it had spicy ginger ale, it's quite enjoyable, but time to time I had ice cream headaches.